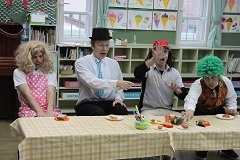 Once we returned from the park it was time to watch a short play about eat manners. All of the children called out to the main character, “No, David!” whenever he did something rude or used bad manners (not washing his hands before eating, talking with food in his mouth, playing with his food, etc). After the play it was dinner time and everyone was treated to a British style 3 course meal. The first course was the vegetable soup the children had helped to prepare. 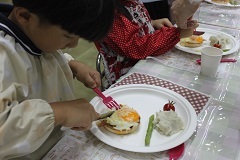 The second course was mashed potato, asparagus, eggs, English muffins, bacon and tomato. The third and final course was fruit jelly with cream and strawberries. There were many calls of, “It’s yummy!”, “More soup, please” and “More bacon, please”. After everyone had thanked the waitresses and cooks we went upstairs to make prince and princess crowns with `Prince Craft`. 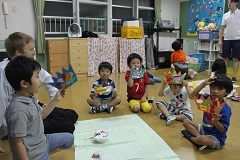 We ripped origami paper and glued them to our crowns to make cute colourful patterns like diamonds, rubys and saphires. We also learnt lots about British culture, how the United Kingdom’s flag is made, British food and history. Everyone has had a fun packed and busy first day and are now all fast asleep awaiting tomorrow mornings breakfast and exciting activites.